The next best thing to living in a centuries old farmhouse in Provence, France is decorating your home as if you do. When you think of French country design, images of sunny and bright colors, multiple patterns and a mix of textures usually comes to mind. This combination results in a room that is inviting and comfortable and easy to incorporate into any home decor. The most commonly used colors in french country decorating come from the outdoors. These include the bright blues of the sky, golden yellows from the sun and lovely reds and greens from the flower fields. They are cheery colors that work well in a breakfast room or casual living area. But it is also possible to use these same colors in more muted tones for a sophisticated and calmer feel. 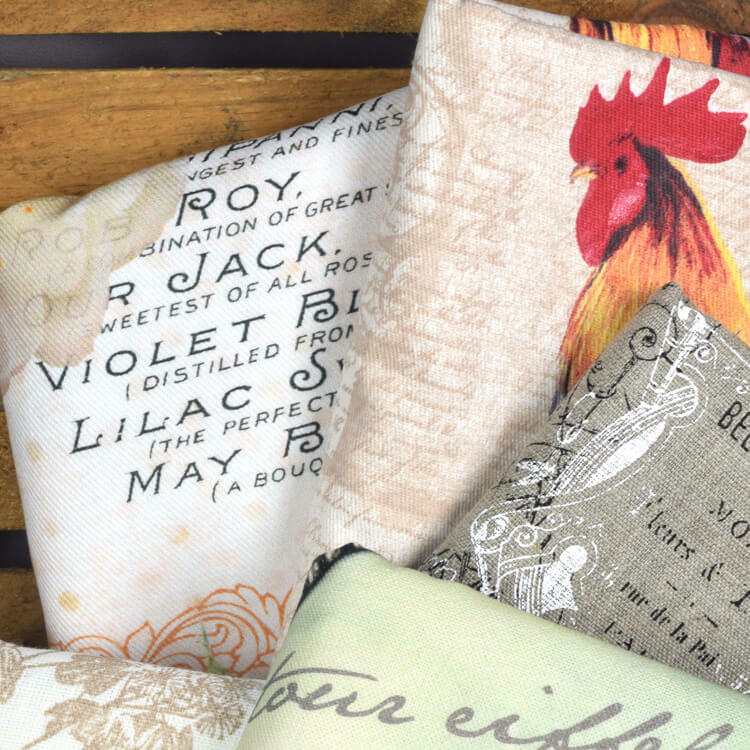 Toile is a fabric that “tells a story” with a pattern often depicting farm scenes or bucolic park scenes from days past. Commonly found in black and cream or red and white, it is now available in many other color combinations. French country decorating combines toile with checks, plaids and florals for the casual look so often associated with this design style. The combination of rough hewn plaster, woven seating and warm wood tones are what makes french country decorating so warm and inviting. Distressing your furniture gives it an aged look that adds to the warm and casual feel of the room. Add some pottery accessories, a vase full of bright sunflowers and the ever present rooster and you have a room meant for relaxation and fun. Click here for beautiful French fabric by Stof. what is the size of the sample fabric? BEST ANSWER: Our samples are generally 4 x 4 inches.